I’m not – or at least I don’t think I am – usually drawn to true crime, but so many of you went on about how good The Suspicions of Mr Whicher was that I had to cave and give it a try. And plus, it’s Victorian true crime. How could I not be interested? This book is about a murder case that took place on 30th June 1860 in a quiet country road in Road, Kent. Like in a typical country house mystery, the house was locked from the inside, which automatically meant that all of its inhabitants—an upper class family and their servants—were suspects. I’m not exactly squeamish, but I have to say that the first few chapters of the book, where the murder is described, were hard to read. This is because the victim, Saville, is only three years old. He’s removed from his cot at night and killed—I won’t tell you how, but it’s quite horrifying. The way Kate Summerscale describes the violence is very clinical, but it was hard not to feel queasy. Still, I want to clarify that The Suspicions of Mr Whicher doesn’t feel exploitative or gratuitously scandalous in the least. It’s always respectful and humane, and that was one of the reasons why I loved it so much. The Suspicions of Mr Whicher reads like a mystery novel—we follow the case from the beginning; we’re only given answers as those investigating it come to them. As the title indicates, there’s a particular focus on Jack Whicher, a renowned Victorian detective who inspired Sergeant Cuff in Wilkie Collin’s The Moonstone. Which brings me to my next point—not only does this book read like a mystery, but it’s also about mysteries. It goes beyond this specific murder case to focus in the impact it had on Victorian culture, particularly on the emerging detective novel. It also focuses on how the image of the detective evolved, both in literature and in reality. Kate Summerscale establishes parallels with books such as The Moonstone, The Woman in White and The Turn of the Screw. Having read all of these recently, I was of course extremely interested. I can especially see the traces of Road Hill House murder in The Moonstone—the crime is a lot tamer, but the basic elements are mostly the same. The downside of all these literary allusions is that there were spoilers for all of the aforementioned books, and also for Lady Audley’s Secret, I assume. I skipped ahead as soon as Summerscale began to discuss it, because I’m planning to read it soon and didn’t want to have it spoiled. But as I was saying, the cultural and literary analysis of the impact this murder case had on Victorian sensibilities is what makes The Suspicions of Mr Whicher so interesting. This brutal murder didn’t take place in a gritty alley, but in an upper-class house in the country, which forced the Victorians to rethink assumptions about class, gender, money, respectability, and how all of these relate to violence and crime. These were the very same issues—the cracks in Victorian ideology—that made all those Gothic classics I’ve been reading so interesting to me. If The Suspicions of Mr Whicher has a flaw, it’s the fact that sometimes it could have gone further—it could have asked more questions; explored the contradictions a bit more. But this is really a minor quibble—the book is on the long side as it is, and I understand why Summerscale couldn’t discuss everything in detail. Now that I got my quibble out of the way, I can wholeheartedly recommend this book, even to those who aren’t normally the biggest fans of non-fiction. Like the best mysteries, it’s impossible to put down. The word ‘clue’ derives from ‘clew’, meaning a ball of thread or yarn. It had come to mean ‘that which points the way’ because of the Greek myth in which Theseus uses a ball of yearn, given to him by Ariadne, to find his way out of the Minotaur’s labyrinth. The writers of the mid-nineteenth century still had this imagine in mind when they used the word. ‘There is always a pleasure in unravelling a mystery, in catching the gossamer clue which will guide to certainly,’ observed Elizabeth Gaskell in 1848. To get at the inner thoughts and feelings of the Kent household was more a matter of instinct than logic, what Charlotte Brontë described as ‘sensitiveness – that peculiar, apprehensive, detective faculty’. A vocabulary was emerging to capture the elusive new detective methods. In 1840 the word ‘hunch’ was first used to mean a push or nudge towards a solution. In the 1850s ‘lead’ gained the meaning of a guiding indication or a clue. The mid-Victorians were transfixed by the idea that faces and bodies could be ‘read’, that the inner life was imprinted on the shapes or features and the flutter of the fingers. Perhaps the fascination stemmed from a premium placed on privacy: it was terrifying and thrilling that thoughts were visible, that the inner life, so jealously guarded, could be instantly exposed. People’s bodies might betray them, like the heartbeats of the killer in Poe’s ‘The Tell-Tale Heart (1843), which seemed to pound out his guilt. Perhaps this is the purpose of detective investigations, real and fictional – to transform sensational, horror and grief into a puzzle, to make it go away. ‘The detective story,’ observed Raymond Chandler in 1949, ‘is a tragedy with a happy ending.’ A storybook detective starts by confronting us with a murder and ends by absolving us of it. He clears us of guilt. He relieves us of uncertainty. He removes us from the presence of death. Hmmm...I've never wanted to read this one before, but I've read every book you mentioned so I'm curious about that angle. Will think about it! I'm intrigued - I'm adding this one to my list. I picked up a like-new hardcover copy at the library book sale last summer. Sounds like I should read it while The Woman in White is fresh in my mind. I didn't think I would be a true crime fan either (although I love a good mystery! ), but over the summer I read Midnight in the Garden of Good & Evil and loved it, so I have become a lot more open to reading other books within the genre. I have a copy of In Cold Blood that I will need to read, and this book is now on the list as well. I think the Victorian angle is really interesting, but as I haven't read either The Moonstone or The Woman in White, I will wait until I've read those before I pick this one up! Thank you for posting the part about the spoilers of the novels. I have this on my TBR list along with some of the books mentioned within. I had no idea they were discussed in the book and that would have been a dissappoitment. I have read other reviews of this and no one mentioned this-- that was very thougtful of you! I am actually a big fan of true crime, so I was all over this one. It was extremely fascinating, but I had a couple of quibbles myself. One, it was insanely dense - very detailed. I had a hard time getting through it if I had ANYTHING on my mind at all. Second, it did give some spoilers on the mysteries of that time, which was kind of a bummer since I've not read them all. But small quibbles, still. For anyone that likes true crime and/or likes a Victorian mystery, this is well worth reading. Oh yes oh yes oh yes...I want this one!!! Even though I keep telling myself I shouldn't like reading true crime, I do. And while I know I should hesitate and read those mentioned novels first, for fear of spoilers, I know I won't because I insist on telling myself that I'm not classy enough and smart enough to read classics anyway. So it seems the path is perfectly clear for me to just go find this book, doesn't it? Well, if the library has it, that is. I guess if not, there is that dang book buying thing standing in the way. Eva: It's completely different from what I thought it would be - almost more like a cultural study of the Victorian era than a true crime book! Charley, I hope you enjoy it! Steph: I've heard great things about Midnight in the Garden of Good & Evil! And In Cold Blood is actually the only other true crime book that I've read. I picked it up because Capote is one of my favourite writers, and I was not disappointed! Heidi: You're welcome! I hate coming across spoilers unexpectedly myself, so I always try to warn others! ds: lol, I hope you'll still thank me after you read it :P But seriously, it's a lot more interesting that I thought a true crime book would ever be! Debi: BAD, BAD Debi >:( Do I need to call Eva to take care of you? :P Seriously, there's absolutely NOTHING about any of those classics (ANY classic, really) that you wouldn't understand. I understand not particularly wanting to read them, though, and I do think this would be enjoyable regardless! I've heard of this title, but guess I never realized it was true crime. Everyone seems to love this book - the time period alone makes it sound fascinating. I'm so pleased to hear that you enjoyed this book - I loved it! My only minor quibble would be that it gave away the endings of many classic crime books, but I'm trying to forget those spoilers before picking one up! Victorian true crime? Count me in. Thanks for your review. Like you, I don't read much in the true crime category. But ... Victorian true crime would be of interest. 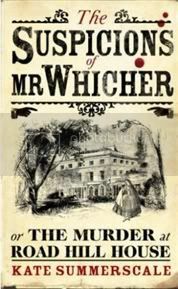 I like your comment that "the cultural and literary analysis of the impact this murder case had on Victorian sensibilities is what makes The Suspicions of Mr Whicher so interesting." A Victorian mystery! Now I'm really intrigued! :D Thanks for your lovely review, Nymeth! I'm in the middle of reading this, and I like it more than I was expecting - though yeah, the description of the murder was most unpleasant. (I skimmed that bit.) I'm having a hard time keeping track of everyone! but hopefully that'll get easier as they narrow things down. This one does seem to be tugging at me....I may have to give in!! Ummm...need a spyder jacket Ana? What the hell is a spyder jacket anyway? I'm sure as hell not clicking on those links to find out! Anyway! This book sounds fascinating!! I go through periods where I like to read true crime stories, but most of the time they disturb me because they really happened, lol. But this sounds really well written!! And I love that it makes references to other literature. I see you got the same spam visitor that I got! Aren't we lucky? This isn't my normal read either, but I might have to look into it! Have you given anymore thought to what I will be reading? Thanks for the review, Ana! I haven't actually read any true crime stories but I think I have a few in my TBR pile. I read this a while ago and thought it was a very engaging, albeit somewhat dense read. I don't read a lot of true crime, but reading about the start of the police force was very interesting. I NEED to read this one! I've been wanting to ever since the first reviews trickled in and I bought it this summer. I'm a little daunted by the length, though. I didn't know that Whicher inspired Sergeant Cuff! That makes me even more excited to read the book! I've looked at this one a few times in bookstores but never really thought it was for me... but now I'm rethinking that! Sounds like an excellent book to read over the winter, too. Fantastic review! Great review! I really liked this book because I love the Victorian Era! Diane, hope you enjoy it if you decide to pick it up! A Bookshelf Monstrosity: You're welcome - enjoy! Terri: That was really the most interesting part. Jenny: It does get easier - later on they mostly focus on... well, I can't tell you who :P But it does get much easier. Molly, thank you! And thank you for YOUR review, which was one of the ones that made me covet it. Alice: This was only my second ever. They're out of my comfort zone, but then again, it's nice to venture out sometimes! Marg: I found that very interesting too! I had no idea about the initial association between investigators and a sense of surveillance. Trish, I hope you enjoy it! Having read The Moonstone before it make it even more enjoyable, and not just because of the spoilers. Meg: Yes, it was perfect for this time of year, just like a "real" mystery! I recently bought this on a whim, I'd never heard of it before. I'm glad I did now and hope to get to it soon! I really enjoyed this book for all the reasons you picked out. I'm not at all a fan of true crime - my dad likes to watch that kind of show on TV and I hate it - but I loved the depth of cultural detail that Summerscale explored from that crime. I'd read almost all of the books mentioned, so I could really connect the dots. I can see your point about the spoilers, though. I loved this book, and thought it was a really involving read. I agree with you about details of the murder in the first sections being hard to read. What I found so extremely interesting about this book was the literary connection that you mentioned. I remember reading how Whicher was basically the model for all the detectives in the literature of the time and how he was the first to revolutionize techniques that are used even today in the same types of cases. Amazing book. I think I would have trouble with the graphic descriptions, but the book sounds interesting. Thanks for the review! This is a good exploration of the police, Victorian society, and women, I found, too. And a lovely review, Nymeth, as ever! One day I expect to see all your reviews collected in a book - and I'll be first in line to buy it! I thought it's a terrific book - my post on it is here. Joanna: I look forward to you thoughts! S. Krishna: They're difficult to read, but at least she doesn't mention them again after those initial chapters. Naida: I'll look up The Monster of Florence! Susan: I think I will :D I finished my first Sayers a few days ago, btw, and it was excellent. BooksPlease, thank you for your link! Thanks for your interesting review! I found it via the link from the Jack the Ripper book review from today. You're more positive about The Suspicions than me, but I didn't realize it was non-fiction when I bought it.